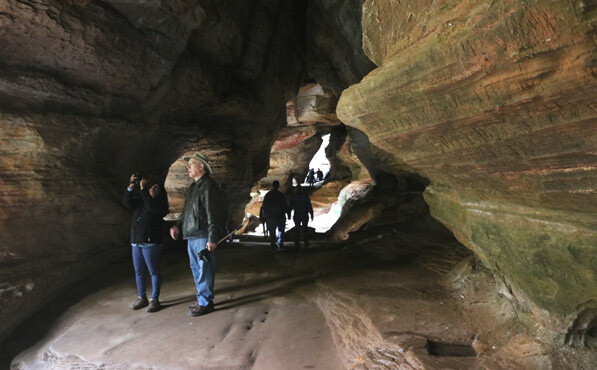 Rock House is one of the 7 hiking areas of Hocking Hills State Park system- Old Man's Cave, Ash Cave, Rock House, Conkle's Hollow, Cedar Falls, Hemlock Bridge Trail to Whispering Cave, and Cantwell Cliffs. Each of the park areas offers a unique experience for those who walk its paths. From hemlock-lined trails, to huge rock formation, waterfalls to rock bridges, guests to the park are sure to treasure their explorations for years to come. Rich in forested areas and natural wonders, there are over 25 miles of hiking trails in the Hocking Hills State Park system. The Look: The closest thing to a real cave in the park system, Rock House's cavern seems to go deep into the rock. The trail is packed with awesome cliff faces that, in summer, look like a South American jungle, rock steps and plenty of breathe-taking views. Dogs are allowed on this trail on leash. There are cliff dropoffs. A 1/4 mile trail leads to an opening in a cliff face with gothic-like windows and awesome views. Rockhouse was even once said to be a hide-out for bandits and thieves in 1800's. -look for small recesses in the back wall of Rock House that were used as baking ovens for Native Americans staying in the cave. -square troughs in the floor are believed to be used to catch water. -at the picnic shelter, there was once a 16-room hotel compete with a ballroom, livery stable and a U.S. Post Office. 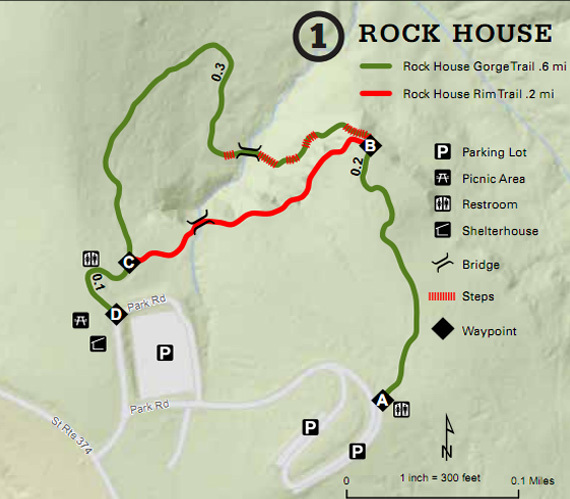 The Rock House trail is about a 1/2 mile long and takes 30 to 45 minutes to traverse.